Below are the technical requirements for GenesisOne T-SQL Source Code Unscrambler™. If you have any questions regarding technical specifications, please contact us. Windows XP, Windows Vista, Windows 7 and Windows 8/ 8.1. SQL Server 2008 or 2008 R2, or 2012. Microsoft .NET Framework 4.5 or later. 1GB RAM minimum; 2 or more recommended. 30 MB hard disk space. Runs on a user's PC (can also run on a server). Please note that this product has not been tested on an Itanium server. At the end of purchasing process you will be sent or emailed invoice with 16 symbol serial number. Here is an example of a serial number included in an online order confirmation. If you lose your serial number then you can contact GenesisOne Software Sales at sales@genesisone.com with the name, e-mail address, and proof of purchase, if available. To start your product activation, enter your serial key in ACTIVATE account textbox. Then click the submit button to activate your account. When your activation has been confirmed, the Activation Successful page is displayed. 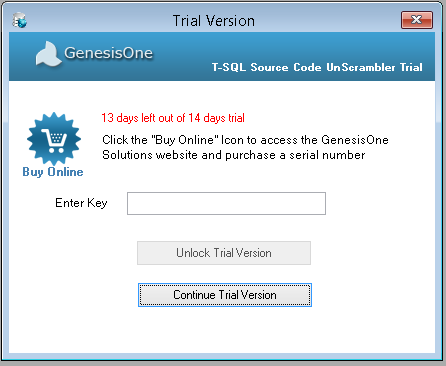 This is the GenesisOne T-SQL Source Code UnScrambler Installation Guide for Windows Platforms. The GenesisOne T-SQL Source Code UnScrambler Installation Guide is a Portable Document Format (.pdf), which you can open on any computer that supports this file type. Note: Support request emails will be sent directly to the GenesisOne support team.